Church service • Boston Mormons recall not a stern, stiff sermonizer, but a caring, creative leader. Republican presidential candidate former Massachusetts Gov. Mitt Romney addresses an audience during a campaign stop in Rockford, Republican presidential candidate former Massachusetts Gov. Mitt Romney walks to speak to supporters at his Nevada caucus night vi Courtesy photo Family photo from the 1960s provided by Romney for President Inc. shows Mitt Romney, left, and brother Scott with t Jim Cole | AP file photo Republican presidential candidate Mitt Romney speaks during a campaign stop with mill workers at the Ma Steven Senne | The Associated Press Republican presidential candidate Mitt Romney addresses an audience as his wife, Ann, looks Evan Vucci | The Associated Press Republican presidential candidate Mitt Romney shops with his wife, Ann, left, and Puerto Rican Steven Senne | The Associated Press Republican presidential candidate Mitt Romney lifts 8-month-old Gavin Woodford, of Rockford, Steven Senne | The Associated Press Republican presidential candidate, former Massachusetts Gov. 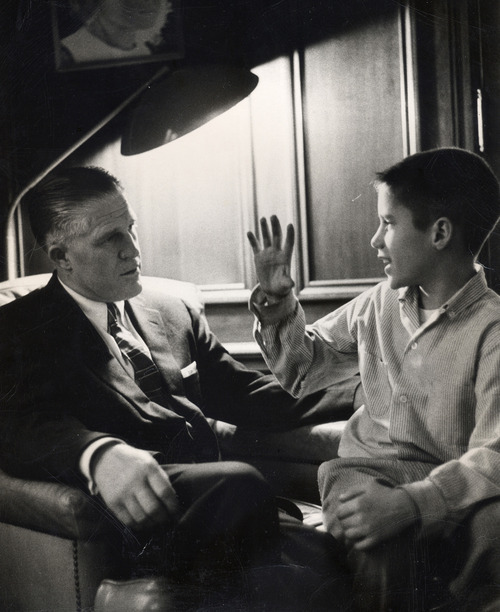 Mitt Romney speaks at the Unive Courtesy photo This 1957 family photo provided by Romney for President Inc. shows George Romney and son Mitt in their Detroit, Mic C.J. Gunther | AP file photo Republican U.S. Senate candidate Mitt Romney greets supporters at the Columbus Day parade in Worces Scott Gries | AP file photo Thomas S. Monaghan, founder and chairman of Domino's Pizza Inc., left, and Mitt Romney, managing dir Courtesy photo This 1965 photo provided by Romney for President Inc. shows Mitt Romney with his future wife, Ann Davies, on the da Courtesy photo This 1953 photo provided by Romney for President Inc. shows 6-year-old Mitt Romney with a baseball bat in Detroit. Republican presidential candidate former Massachusetts Gov. 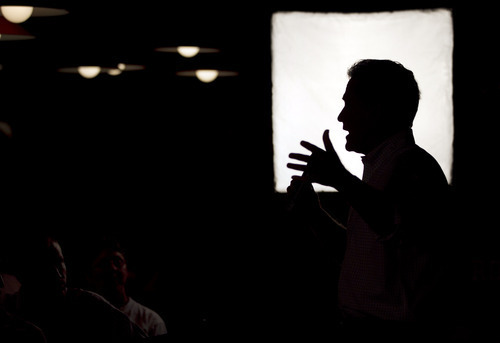 Mitt Romney addresses an audience during a campaign stop in Rockford, Ill., Sunday, March 18, 2012. (AP Photo/Steven Senne) Republican presidential candidate former Massachusetts Gov. 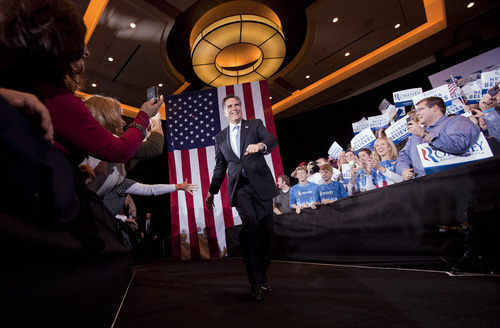 Mitt Romney walks to speak to supporters at his Nevada caucus night victory celebration in Las Vegas, Saturday, Feb. 4, 2012. (AP Photo/Julie Jacobson) Courtesy photo Family photo from the 1960s provided by Romney for President Inc. shows Mitt Romney, left, and brother Scott with their father, George, at their home in Bloomfield Hills, Mich. Jim Cole | AP file photo Republican presidential candidate Mitt Romney speaks during a campaign stop with mill workers at the Madison Lumber Mill in Madison, N.H., on Dec. 12, 2011. Steven Senne | The Associated Press Republican presidential candidate Mitt Romney addresses an audience as his wife, Ann, looks on during a campaign stop in Vernon Hills, Ill., Sunday, March 18, 2012. Evan Vucci | The Associated Press Republican presidential candidate Mitt Romney shops with his wife, Ann, left, and Puerto Rican Gov. Luis Fortuno during a campaign stop Saturday, March 17, in Bayamon, Puerto Rico. Puerto Ricans are U.S. citizens but don't pay taxes and can't vote in U.S. presidential elections. 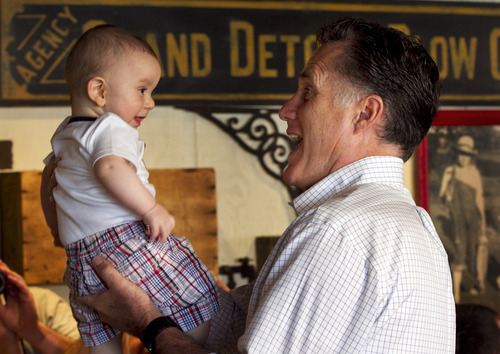 Steven Senne | The Associated Press Republican presidential candidate Mitt Romney lifts 8-month-old Gavin Woodford, of Rockford, Ill., during a campaign stop in Rockford on Sunday, March 18. Steven Senne | The Associated Press Republican presidential candidate, former Massachusetts Gov. Mitt Romney speaks at the University of Chicago March 19, 2012. Courtesy photo This 1957 family photo provided by Romney for President Inc. shows George Romney and son Mitt in their Detroit, Mich., home. C.J. 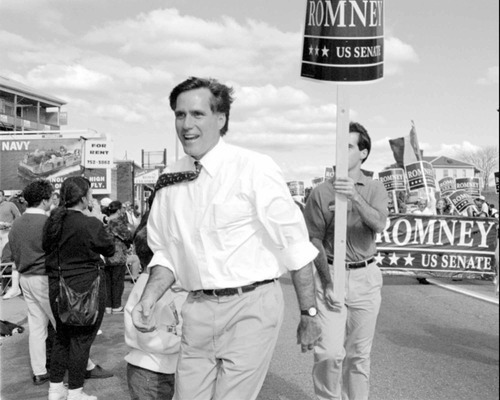 Gunther | AP file photo Republican U.S. Senate candidate Mitt Romney greets supporters at the Columbus Day parade in Worcester, Mass., in 1994, following his father's path into politics. And in one of the bluest of Democratic states, the Republican challenged Sen. Edward M. Kennedy, a liberal icon. 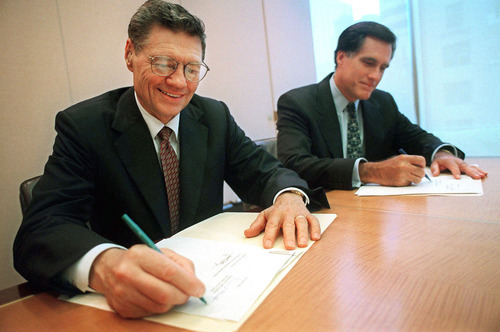 Scott Gries | AP file photo Thomas S. Monaghan, founder and chairman of Domino's Pizza Inc., left, and Mitt Romney, managing director of Bain Capital Inc., sign an agreement in 1998 for Monaghan to sell a "significant portion" of his stake in the company to Bain Capital in New York. 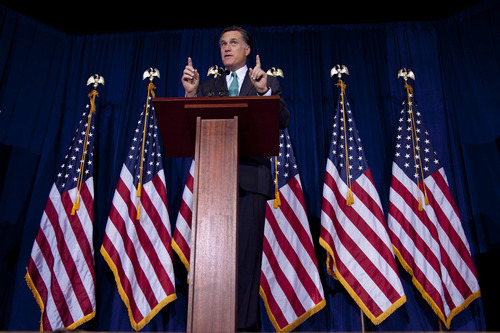 With Romney at the helm, Bain Capital helped launch or reshape hundreds of companies, including Staples and Domino's Pizza. Romney went on to make tens of millions of dollars, part of a net worth now estimated at up to $250 million. 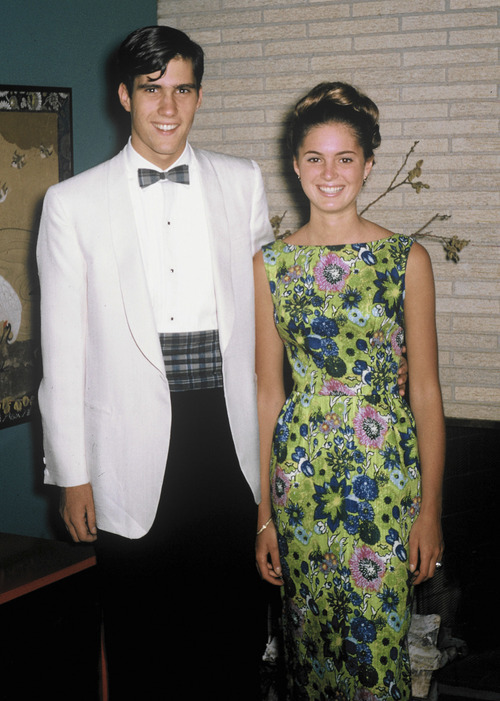 Courtesy photo This 1965 photo provided by Romney for President Inc. shows Mitt Romney with his future wife, Ann Davies, on the day of Romney's senior prom in Bloomfield, Mich. 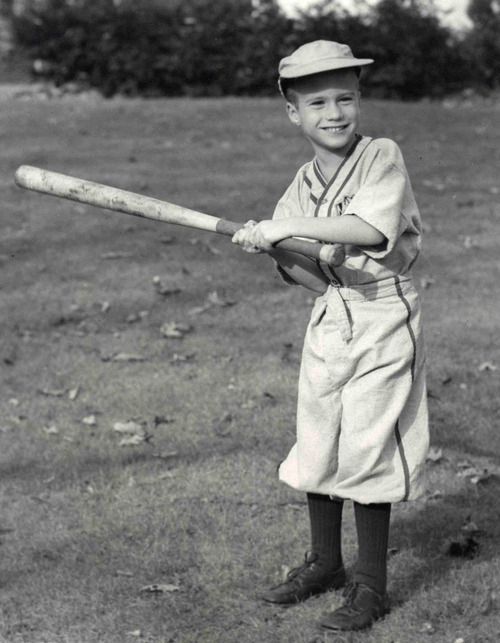 Courtesy photo This 1953 photo provided by Romney for President Inc. shows 6-year-old Mitt Romney with a baseball bat in Detroit. The Mitt Romney whom many Americans see today is often depicted as wealthy, wooden and out of touch with the working class. To some, he seems gaffe prone, detached, even distant. But that's not the man Boston Mormons knew in the late 1980s and early '90s, when Romney was an LDS leader, colleague and friend. Many saw him as an eloquent speaker, a compassionate counselor and a creative problem-solver, generous with his money and quick to help any in need. Are the two guys related? 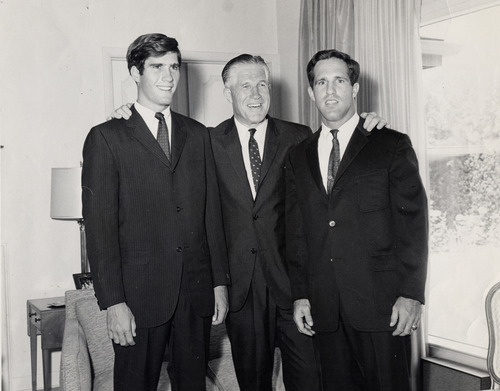 While Romney was building his career at Bain Capital, he was also an LDS bishop (equivalent to a pastor) and a stake president (presiding over several area congregations) in Belmont, Mass. Because the Salt Lake City-based Church of Jesus Christ of Latter-day Saints has no paid clergy, Mormon men take turns overseeing wards (congregations) and stakes while continuing their full-time careers. As a religious leader, Romney met weekly with students, teachers, immigrant converts and Utah transplants. He had to learn how to give sermons, advise squabbling couples, organize worship services, manage budgets and address the diverse spiritual needs of more than 1,000 Mormons in the region. What to do with church members from Southeast Asia, who spoke separate languages and needed a place to worship together? How to help the desperately poor Haitians find jobs? Should he respond to feminists who were pushing for more leadership and involvement? By most accounts, Romney was a good listener, a measured thinker and an innovative manager who considered various positions before making decisions. He was occasionally willing to work around bureaucratic edicts from Salt Lake City to better serve his people. He allowed divorced men to continue in their leadership positions, rather than remove them as church policy dictated at the time. When LDS Family Services refused to place a baby with Brett and Janna Sorensen because Janna planned to return to work, Romney backed the couple. Eventually, the policy against adoptions for working moms changed. To most members, Bishop Romney was pragmatic and open. 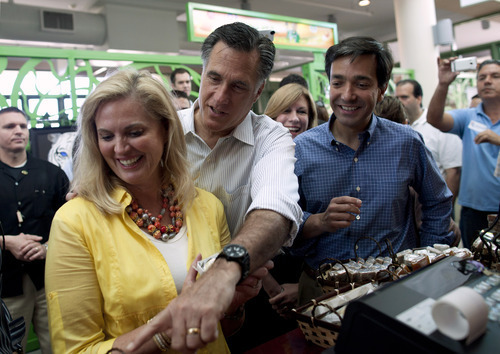 Competence counts • Given Romney's experience in the working world, friends say, he was attracted to competence. He chose men with keen expertise as his two counselors in the stake presidency, relying on them more than on the 12 men who sat on the "high council." He also counted on competent people and didn't have much use for those who were not. "I don't think Mitt cares whether people are male or female, rich or poor, Republican or Democrat, old or young," says Helen Claire Sievers, director of the WorldTeach program housed at Harvard, "but he really cares about their competency." Sievers says Romney was "a wonderful leader because he really cared. He gave every ounce he had, and he had many ounces to give." Romney was "comfortable in his skin," recalls Philip Barlow, chair of Mormon History and Culture at Utah State University, who was one of Bishop Romney's counselors. The future Republican presidential front-runner even showed off his "moon-walking" skills one day, gliding backward in a smooth imitation of Michael Jackson. 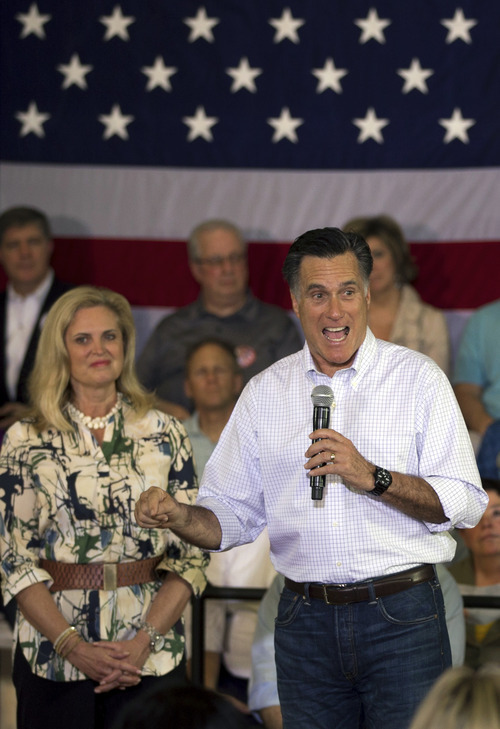 Like some LDS leaders, insiders say, Romney could be insistent on the rightness of his position. He was used to dictating actions, then having the members raise their hands in support. He did not have to make a case for his decisions nor persuade his listeners with a compelling argument. That didn't work so well with feminists. Abortion and adoption • Though sometimes progressive in his approach to women's issues, Romney nonetheless was a product of the LDS male culture of the time. He didn't initially believe, for example, that there were cases of physical or sexual abuse of women in the stake, though plenty of evidence pointed to it. As a young bishop, for example, Romney got word that Carroll Shelton, a woman in his ward, was considering an abortion. This was Shelton's sixth pregnancy. She was in her 40s, had four teenage children and had developed medical complications. Her stake president had already approved the procedure when Romney arrived at the hospital and forcefully counseled her against it. Shelton later wrote about the experience anonymously in Exponent II, a national newspaper for Mormon women that was published in Romney's Boston stake. (She allowed her name to be used for the first time in Ronald Scott's recent book, Mitt Romney: An Inside Look at the Man and His Politics. Peggie Hayes, a single woman with a child, was in Romney's ward when she became pregnant. She alleges that Romney threatened her with excommunication, Boston Globe reporters Michael Kranish and Scott Helman write in their book The Real Romney, and a loss of salvation if she didn't put up the baby for adoption. "Give up your son," was the message Hayes said she got from Romney, "or give up your God." 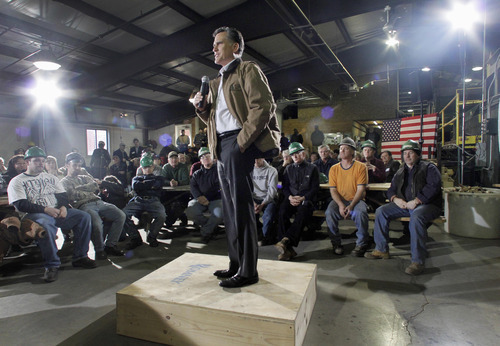 Romney has denied the story, and biographer Scott, for one, doubts it happened that way. "Local members do not recall a single person who was excommunicated or disfellowshipped while Mitt served as president of a stake that probably has as many religiously rococo and fiercely independent academics, writers and thinkers as any in the church," Scott says. "Mitt eschewed using church councils to settle ethical and financial disputes between members, encouraging them instead to press their claims in civil court." Besides, Scott notes, threatening excommunication like that would have been against the rules  and Romney was a rule-follower. Meeting with feminists • Mormon women in Boston still talk about an extraordinary 1993 meeting Romney called to address the women of the stake. More than 250 members poured into the Belmont chapel. One by one they called out their issues while he stood at the front with three pads labeled: policies we can't change, practices we can change, and things we can consider. Nearly 100 proposals were made that day, including having female leaders give talks in various wards as the men on the high council do; letting women speak last in church; turning the chapels into day-care centers during the week; letting women stand in the circle while blessing newborn babies; recognizing the accomplishment of young women as the church does of Boy Scout advancements; and putting changing tables in the men's rooms. Many women left with a new appreciation of Romney's openness. "I was really surprised," she says. "He implemented every single suggestion that I would have." Of all the Boston stake leaders Sievers has seen, she says, "Mitt seemed to me to have the most compassion and the most responsiveness to speakers." It's the single biggest reason Sievers "was such a fan." Acts of kindness • The young venture capitalist clearly saw the benefit of working with other faiths. After a suspicious fire in 1984 destroyed the beginnings of the Belmont chapel, eight churches offered to share their space. Instead of settling on one, Romney chose three  the Catholic Church, Plymouth Congregational Church and Armenian Protestant Church. After each weekly meeting, Romney insisted the Mormons stay behind to vacuum the floors, wash the chalkboards and pick up the chairs. That requirement, Barlow recalls, taught the members, even affluent ones, to value other people's sacred spaces and to do seemingly menial labor. Not long after Grant Bennett fell off a ladder and broke his foot while trying to dislodge a hornet's nest outside his second-story bedroom, Romney came to offer sympathy and show Bennett a smarter way to deal with the festering insects  from inside. Clayton Christensen, a Harvard business professor, and his wife, Christine, told The New York Times that at one time he felt overwhelmed by all that he was expected to do for the church. The couple had three young children, while he was expected to direct the area's missionary work and his wife was the president of the all-women Relief Society, offering weekly spiritual lessons and compassionate service. One night Romney showed up unexpectedly. "He said, 'I was just driving home from work,' " according to The Times, " 'and I had a feeling that I needed to stop by and tell you that God loves you.' "
Christensen was so moved, the story reported, "that he wept." Public image • Barlow does not support Romney's politics but believes his former bishop has been unfairly caricatured in the press. "I do not believe his public demeanor is a false persona," Barlow says. "He has a certain elegance or formality about him even when he jokes around in private, even when I saw him theatrically and comically do his moon-walk, even in his swimming shorts while flipping burgers at his island retreat while hosting guests, even when in dirty Levi's while climbing a ladder to fix a ward member's leaky roof." Asking the candidate to "appear more informal is ironically asking him to become less authentic so that he can appear as more authentic," the USU historian says. "We ought to allow him to be who he is and make our judgment on that basis." Tony Kimball, who served as executive secretary during Romney's stint as stake president, saw Romney as "very warm and outgoing." Although some Mormon feminists back then nicknamed Romney "the plastic man," that wasn't Kimball's experience. The future politician "was not the least bit disconnected. He never was out of touch," Kimball writes in an email. "In our meetings, he was always jovial, and they were fun times." Moreover, Kimball recalls, "the Mitt Romney of the late 1980s and early 1990s really was a moderate. Bain's policies were very progressive compared to most other finance firms. The hard-line profile he seems to be pushing is light-years away from where he was when he was [LDS] stake president." In this current incarnation, Kimball says, "I have absolutely no clue who this guy is." Before his first presidential run, according to biographer Ronald Scott, Mitt Romney met with then-LDS Church President Gordon B. Hinckley. The conversation eventually turned to whether a run for the presidency would be good for him and the church, reports Scott, author of Mitt Romney: An Inside Look at the Man and His Politics. Romney left with the clear impression that the upbeat Mormon prophet was not worried one whit about the additional scrutiny a presidential campaign might focus on the faith and its teachings. Scott says Hinckley was emphatic about steering wide of any and all partisan political involvements. "The choice to run or not must be yours and yours alone," he reportedly advised, firmly but kindly. This is an updated version of a Salt Lake Tribune story that ran in January 2008.